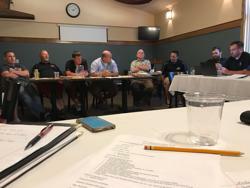 Twenty-one individuals represented members of the Executive Committee of the Wisconsin Wrestling Coaches Association met Sunday, July 8, 2018 for a total of six hours to select the 2018 class of the George Martin Hall of Fame and hold a business meeting. Executive committee members traveled to the Dells from all corners of the state of Wisconsin. Chris Hansen made the seven hour round trip (prolonged by construction) from Hudson, logging the most miles and travel time. Other members arrived from outlying areas of Milwaukee, Green Bay, Madison and La Crosse. Six individuals selected for the 2018 class of the Hall of Fame will be announced in the near future. The meetings were held in Wisconsin Dells, at the Spring Brook Resort who made their meeting room available at no cost. Thank you Spring Brook and Dar Mor. Following Hall of Fame selection meeting a number of committee District Representatives and positions saw the installation of newly elected members and appointments. Appointed to Secretary: John Hatfield - Random Lake to replace Justin Lancaster who moves to District 4 Representative position. The WWCA Executive Committee meets numerous times each year to conduct association business.